The NOAA Office of Ocean Exploration and Research (OER) Digital Atlas is a map-based portal that provides access to all data from OER-supported expeditons that are in the archives. 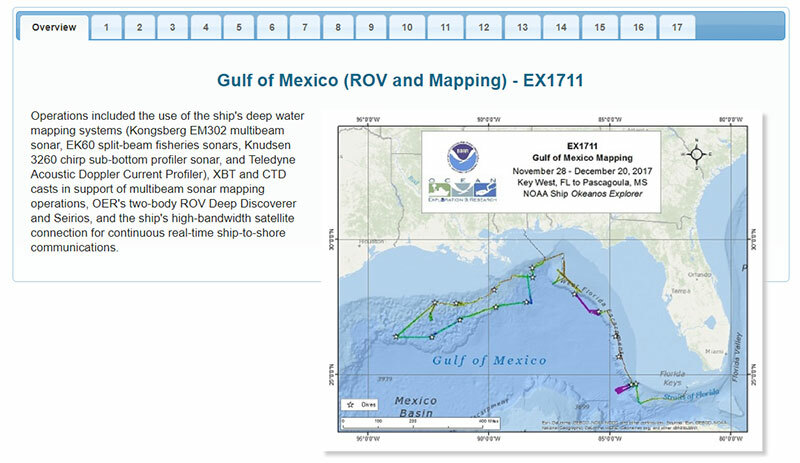 To launch the Digital Atlas, visit: https://www.ncddc.noaa.gov/website/google_maps/OE/mapsOE.htm. 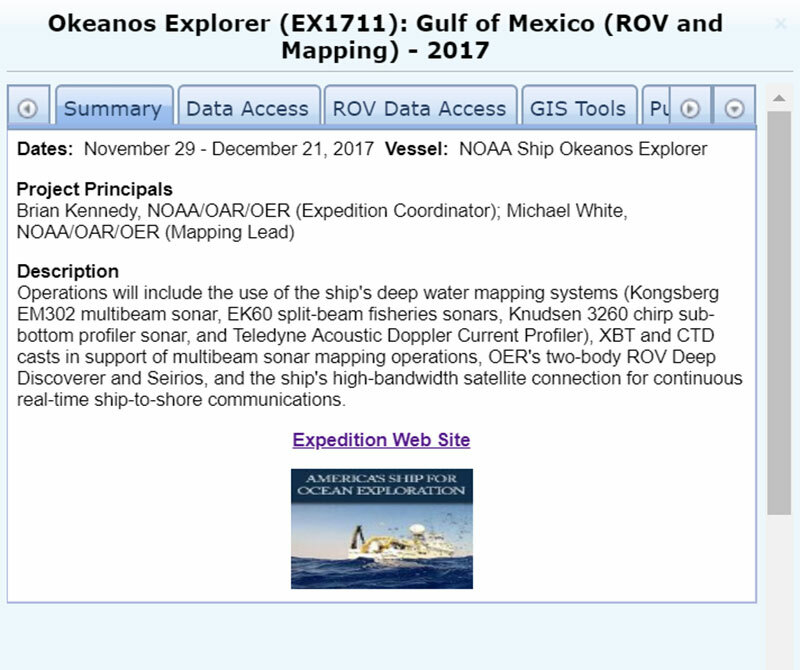 Using the word search tab in the left hand navigation window, you can search by expedition or expedition leg name (i.e., EX1711) or any keyword of interest (i.e., ACUMEN, coral). You can also filter the display by theme or year of the expedition. Once the desired cruise is displayed on the map interface, click the associated dot on the map or the corresponding cruise in the list and a pop-up window will open. Summary: This tab has a summary description; lists the vessel, the project principals, and the cruise dates; and provides links to a related website. Data Access: This tab provides links to various locations where the cruise-related data can be found. More information on this tab is provided below. 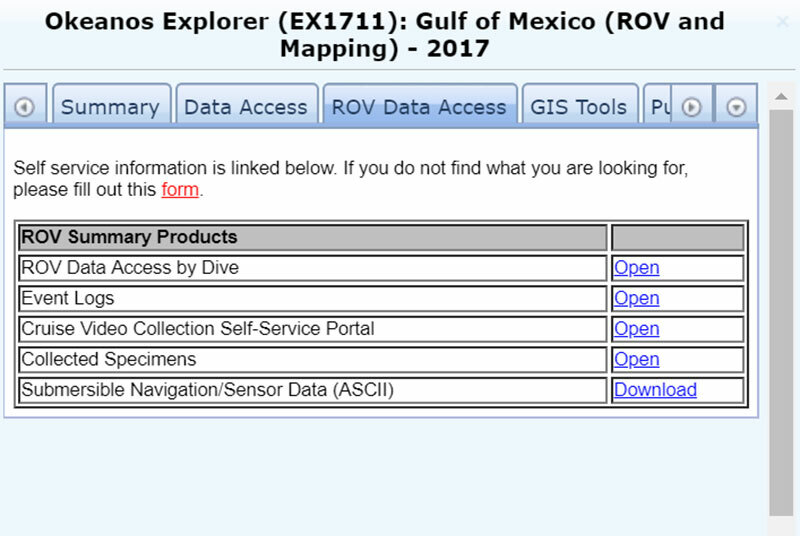 ROV Data Access: This tab provides links to various locations where remotely operated vehicle (ROV)-related data can be found. GIS Tools: This tab provides displayable data on the map as well as a link to open a specialized GIS application, if one is available. Publications: This tab provides access to corresponding publications in an OER Bibliography site maintained by the NOAA Central Library. Education: This tab explains some of the educational materials available for the cruise and provides links to these resources. 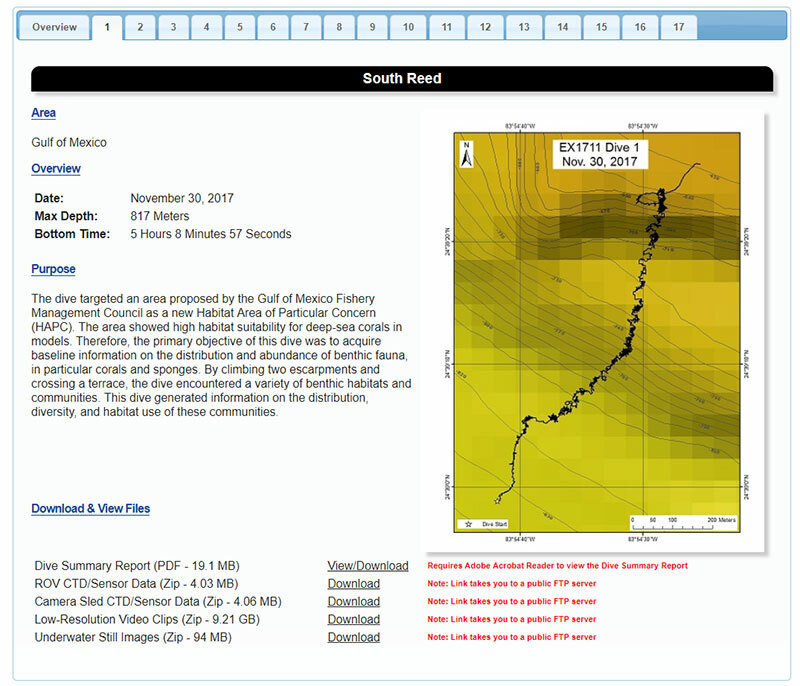 Cruise Summary Products: A cruise summary map image, a displayable ship track in .kml format, a folder of seafloor mapping products, and CTD/XBT cast data. Links to the multibeam data, trackline data (sub-bottom and singlebeam), and water column sonar data. A link to the oceanographic, navigational, meteorological, environmental, and biological data, including multimedia. 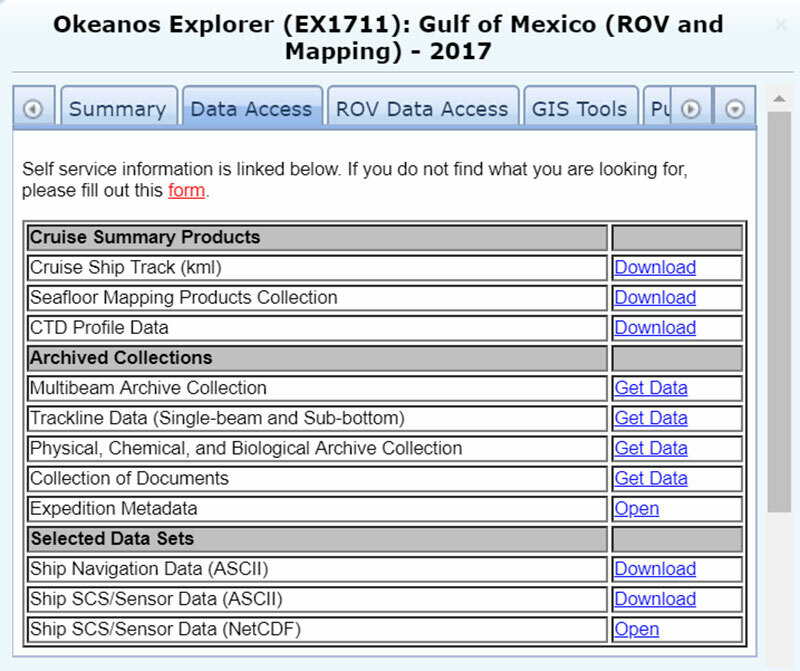 A link to the NOAA Central Library catalog where the user can find documents that relate to the expedition. Selected Data Sets: Downloadable data related to vessel navigation, vessel sensor data, and a NetCDF of all of the vessel sensors. ROV Summary Products: Links to a comprehensive collection of dive-related data, products, documents, images, and the video portal are all found under this section. This section is described in detail below. Sample Repositories: External links to access biological, genomic DNA, specimen, and geologic samples. A scientific discussion of the dive operations, an overall operation area map, and tabbed access to each individual dive is shown. In the cases where an overall highlight video was made, a link to that video will be available from this summary page. This page displays dive details and links to the dive summary report, the dive track in a .kml format, and compressed collections of data. These collections include submersible sensor data, dive images, low-resolution video clips, and ROV data products generated onboard the ship. The OER data management team is committed to providing the reliable, timely access to data produced on board NOAA Ship Okeanos Explorer. They are continuously working with the NOAA archives to expand the types of data available and the ease of access. If you have any questions or suggestions, please contact them at oer.info.mgmt@noaa.gov.